This is a recorded webinar presented by The Complete Trader that goes over several Risk management systems (Coin Toss, Kelly Criterion, Fixed Fractional, Optimal F). 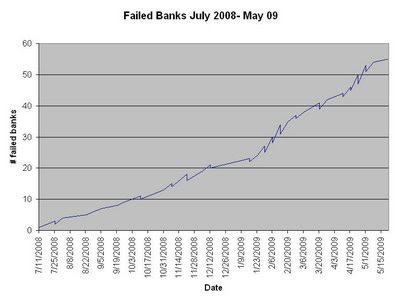 Bank United becomes the biggest bank of 2009 to fail, bringing the total failed banks since July 2008 to 55. The banks' failure will cost the Federal Deposit Insurance Corp an estimated $4.9 billion. 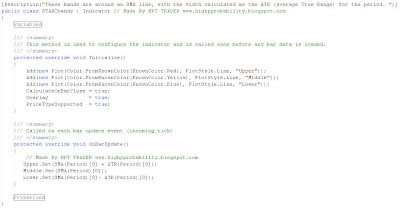 The Pro's and Cons of an Automated trading system for Quotetracker. 2.You can make (or lose) money with it. 1. It is terribly slow on execution because the orders are sent via perl script from quotetracker to bracket trader to Interactive Brokers. (4-8 seconds to get a market order filled). 2. Mailenable; the trade email server reader, may be liable for getting hacked from what I've read, but I don't really understand it at this point in time. 3. The orders sent via bracket trader would get messed up sometimes. This could be a broker related issue, ie- a bracket trade would be sent to IB and sometimes the trade wouldn't execute or the order would be shown stuck as pending on IB's TWS. Conclusion- I've talked to many people that liked how the QT ATS worked and how easy it was to setup. For me, I wanted a system that executed trades faster and was more reliable and that could be backtested. Whether you use QuoteTracker or not, if you don’t have a backtested profitable trading system, then it’s not going to matter how fast the ATS is. A faster trading ATS platform doesn't necessarily mean a better trading system. It is hard to develop a profitable scalping system on a millisecond to second execution level, add in the costs of commission and the average risk for each scalp, and you'll see that systems on a higher time frame are more likely to be profitable. 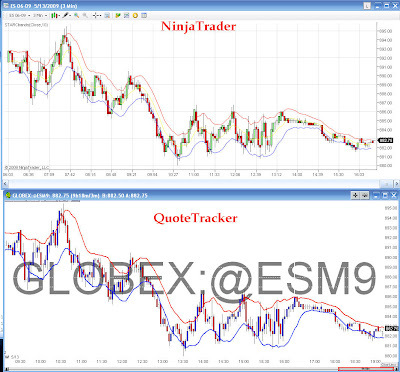 PS- I'm also using Ninjatrader for making custom trading systems, its free to try out for as long as you want. You can backtest and see how your system does and it has many features which enable you to optimize your strategy, and you can code in a max daily loss amount to avoid blowups in-case your ATS isn't trading well. This Video goes over how to add multiple symbols on the same chart like NYSE TICK and NYSE A/D for quotetracker, and how to make custom indicators. 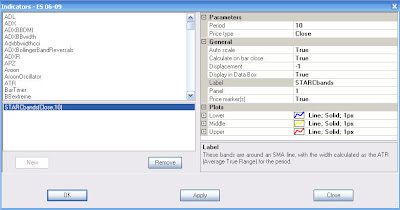 STARC Bands- These bands are around an SMA line, with the width calculated as the ATR (Average True Range) for the period. Indicator settings- To displace the bands back a fixed number of bars, go to the indicator settings. Former FDIC Chairman and CNBC Chief Commentator L. William "Bill" Seidman died Wednesday in Albuquerque, N.M., after a brief illness. He was 88. There comes a point in your trading, where you are against the ropes. You are afraid. You are near broke, and have a steady flow of bills coming in each month. You can't afford to lose any more money. You use to be profitable, maybe handsomely so, but your just not trading like you use to. You wish you could correct the problems that your facing, but your running out of time, money, patience, and you feel even more pressure from the accumulation of all these factors against you in your trading. You are in a death spiral. Instead of going over your trading plan and reviewing your strategy against the current market conditions, you may find yourself thinking of how much you need to get back to BREAKEVEN, or your searching random stocks on yahoo that are the highest percent gainers for the day, or maybe you've stumbled aimlessly onto some stock forum or some blog like this. How is this blog going to help you? The only thing I can do for you is maybe motivate, entertain, and maybe teach you something. Whether or not you put into action your knowledge or experiences is up to you. I only hope that you have a plan. Last fall we saw some CRAZY Volatility (1000pt range in the DOW in a DAY! ), but since the start of the year volatility has declined greatly. I'll tell you what. I felt so bad after my video blowup that it really hurt me in a negative way. I'm sure a lot of people could have seen it as a great lesson to learn from, but being the "Internets' example of how not to trade" made me feel depressed and negatively affected my confidence in trading. After I blew up I wrote a long list of things I did wrong, and what steps I needed to take to correct my bad habits in trading. My failure came when I didn't follow through on the plan. Arggh... I get so tired from writing that last statement in this blog because I've wrote it so many times before. What the HECK is wrong with me? Didn't I learn the first time? Over the last year I've noticed a plethora of traders that share many of the same bad trading qualities I have. Most retailer traders have no edge. It may also be said most retailer traders that have no edge are "newbies" or have traded less then 2 years. To be able to design a working edge requires hard work and time. For the traders that have put in many years looking for the answer when it comes to trade automation and strategy development, many will share my feelings that even the most high end software out there for retail traders right now is just CRAP. You can spend months if not years wasting your time on a strategy that will never work. Perhaps you weren't smart enough to design a good strategy, or maybe its because the available software for retail traders is incapable of automation on a high frequency level, or the software is incapable of comparing multiple data series for correlation studies that you require for your strategy. Whatever the case may be, retail traders have it rough . In this case, maybe you should have gone a step further an hired a programmer to write you a black box. Us retail guys are trading against Hedge Funds that have hired guys with PhD's to make complex strategies that work on high frequencies. Maybe 10 years ago you had a better chance at making money in trading when technology was less of a threat. Maybe then you could have played off the general herd mentality of the market or jumped on to one of the hundreds of momo stocks during the tech boom. There is a sliver of Traders out there that don't need a so called "edge" to trade. Some traders are able to cut losses quick and let runners run. There's been a few days where I felt I was one of these traders. Some days you may have felt the feeling where you were "in tune" with the market, only to see a total failure the next day. You have to realize some people are better at staying in tune with the markets then others. Practice makes perfect. I've written hundreds of posts in my personal journal from my days trading performance, and I would notate the mistakes I would make on a repeated basis. The problem isn't a FREAK ACCIDENT in the stock market where I was long and the market suddenly did the unthinkable (OK maybe 1 freak accident), but the majority of my repeated losses were from not sticking to the plan. Have a plan, a stop, a setup, and don't overleverage yourself (be able to lose 10-20 trades in a row and not let it effect you emotionally). That's it in a nut shell.